Do you have a bulged disc in your neck? Neck pain is extremely frustrating and can originate from a variety of structures. Since the spine is so complex treatment may differ slightly depending on what exactly is causing your pain. In order to resolve your neck pain it’s important to pin point exactly what’s causing it in the first place. In the previous two blog posts we discussed in detail neck pain caused by facet joints and by the muscles surrounding the neck. In this post we will explain neck pain caused by the discs and what you can do to help resolve the pain. In between each vertebra of the spine there is an intervertebral disc that provides cushioning, absorbs shock, help hold the spine together and allows for mobility in the spine. Discs are made up of a gel like substance that is surrounded by a fibrous ring. As we age the discs will naturally shrink due to their high water content. This reduction in disc height is called degenerative disc disease. One study found that before age 40, approximately 25% of people show evidence of disc degeneration at one or more levels. Beyond age 40, more than 60% of people show evidence of disc degeneration at one or more levels. This will occur naturally with age and many people will not experience pain with this. 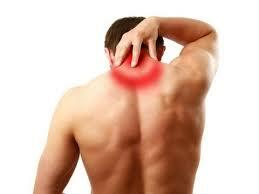 However some people have symptoms such as neck pain and reduced neck movement. A disc bulge or protrusion is when part of the dis begins to bulge out. Depending on the severity the disc can press on a spinal nerve known as a ‘pinched nerve’ and cause pain, numbness and or pins and needles into the arm and hand. Discs can bulge for a variety of reasons such as mechanical stress on the neck, whiplash, and prolonged poor posture. A disc herniation or ‘slipped disc’ is more sever than a disc bulge and is where the ring that surrounds the gel substance on the inside tears causing the gel to leak out. As with a bulge, this will usually press on a spinal nerve and causing a ‘pinched nerve’. Depending on what level the disc herniation is at and what nerve root it is pressing on will determine where you have the pins and needles and or numbness in the arm and hand. This condition is known as radiculopathy. Treatment depends on the severity of the DDD or disc bulge/herniation. In most cases conservative management is the first step. This includes heat, anti inflammatories, correcting your posture and ergonomics, and Physiotherapy which will usually entail soft tissue massage, mobilisations of the neck, dry needling and providing you with a home exercise programme. If a course of conservative management does not help reduce pain and improve function than your doctor may suggest a cortisone injection.Cortisone is a corticoid steroid that is injected into the painful area or joint to help relieve inflammation and reduce pain. Cortisone does not work for everyone but when it does it is usually very effective. If both conservative management and the cortisone injection do not work and the neck pain remains severe then your doctor may discuss the option of surgery with you. This is only in more extreme cases and may include a discectomy (cutting part of the disc out) or fusion (fusing the vertebrae together). What Are The 3 Most Serious Injuries In GAA?